Magical Wishing Beans are proudly made in Australia. Make a Wish today. 3 Beans per pack. Visit The Realm Of White Magic On-line Ordering - we ship to every part of the world. Empower your Realm of spiritual well-being with the magic of Incense, Herbs, Powders, Crystals, Spells and much more. Specialists in rare botanicals, incense and magical supplies since 1989..visit us now! MAKE A WISH TODAY! 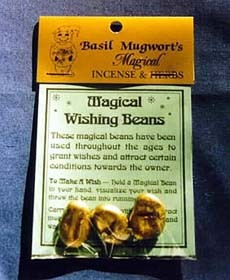 Special Magical Wishing Beans Believed in folklore to grant a wish, attract money and ward of illness. Made In Australia. 3 Beans per pack with easy to follow instructions. Magical Wishing Beans or our Magical Wishing Powder.